Each inlet valve is connected to the main power unit by a low voltage (24v dc) supply. This allows the main power unit to start from a remote location (i.e. inlet valves). The power unit should be plugged in to the main outlet at all times. To operate your Power Unit, plug the hose into the wall valve in the house OR plug your garage hose (optional) into the utility valve on the front of the Power Unit and use the ON/OFF switch to start the Power Unit. To turn the Power Unit OFF remove the hose from the inlet valve. 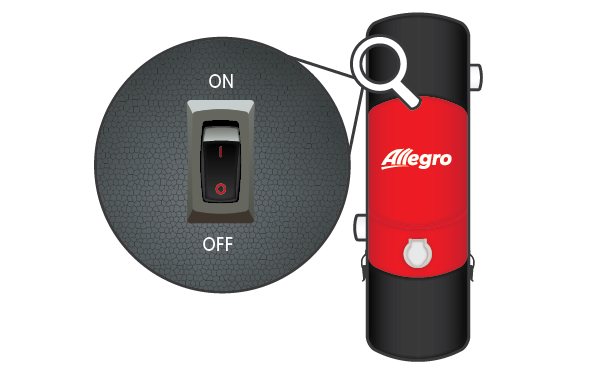 If your hose is equipped with a control switch on the handle, then you will be able to operate (turn ON/OFF) the Power Unit at your fingertips! 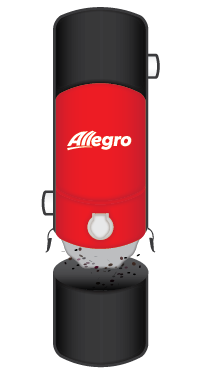 Allegro is designed with an exclusive Filtration System which provides complete protection of the electric blower motor fan assembly. Your main Power Unit requires minimum maintenance. It is normal for some dirt and lint to cling to the filter. For best results, empty the pail when half full. 1. Undo the latches and remove the dirt pail from the Power Unit. 2. Wrap a large plastic bag around the lower portion of the Power Unit, so that the filter is contained with in the garbage bag. 3. Hold the filter through the plastic bag and shake, so the dirt will drop into the bag. 4. Remove the plastic bag from the unit. Empty the remaining contents from the dirt pail into the plastic bag. 5. Re-attach the dirt pail to the Power Unit. To re-attach simply hook both latches to the body. The dirt pail should hang freely. Now, use both hands to simutaneously engage both latches. It is not recommended to engage one latch at a time. WARNING: Do not remove or wash the Cloth Filter to improve the power unit airflow and the performance, once or twice a year you may follow the steps listed above. This appliance is supplied with a power supply cord that is approximately 5'(ft) (1.5m) long. It should be mounted in such a way to enable the power supply cord to be connected directly into an outlet. An extension cord should not be used. Mount appliance at least 12" from ceiling, floor and side wall(s) to ensure adequate ventilation for motor. Do not install in a confined space like a cabinet or closet. Do not vent exhaust air into wall, ceiling or concealed space of building. This appliance must be grounded; if it should malfunction or breakdown, grounding provides a path of least resistance for electric current to reduce the risk of electric shock. 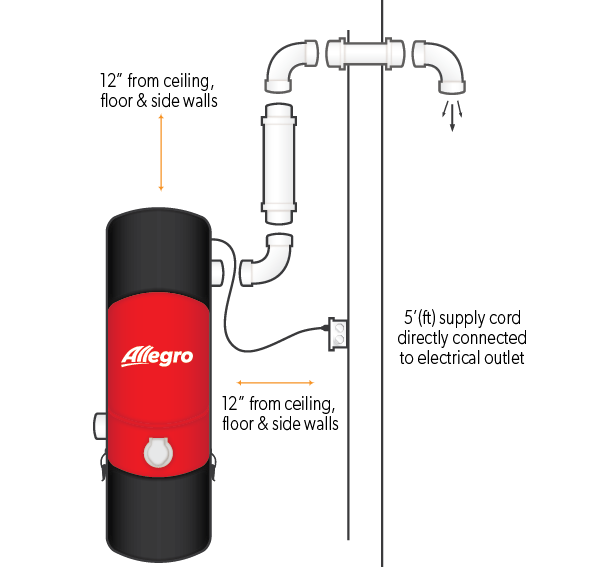 This appliance is equipped with a cord having an equipment-grounding conductor and grounding plug. The plug must be inserted into an appropriate outlet that is properly installed and grounded in accordance with all local codes and ordinances. WARNING: Improper connection of the equipment-grounding conductor can result in a risk of electric shock. Check with a qualified electrician or service person if you are in doubt as to whether the outlet is properly grounded. Do not modify the plug provided with the appliance - if it will not fit the outlet have a proper outlet installed by a qualified electrician. This appliance is for use on a nominal ~120V (volt) circuit and has a grounding attachment plug that looks like the plug illustrated in Figure 3. Make sure that the appliance is connected to an outlet having the same configuration as the plug. Adapter should not be used with this appliance. NOTE: In Canada, the use of a temporary adapter is NOT permitted by the Canadian Electrical Code.